We live the gift card life! If a store offers one you can bet I will be hunting for a discounted gift card before we eat or shop there. 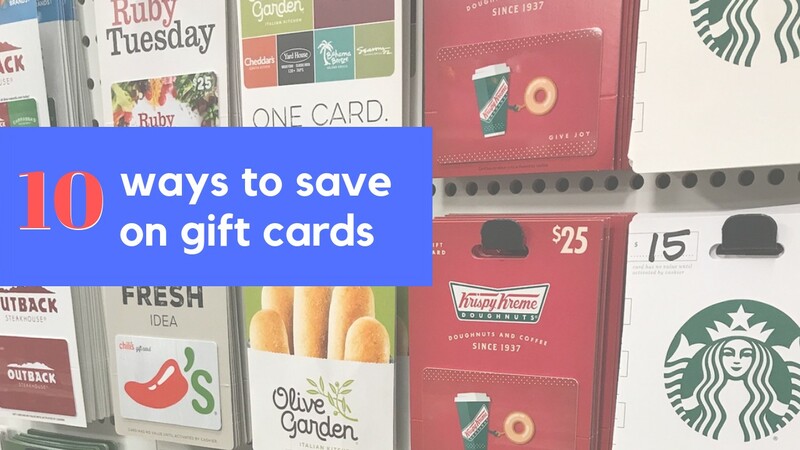 You should always be on the hunt for gift card deals as this is an instant savings that can stack on top of any store coupons or other discounts you have! 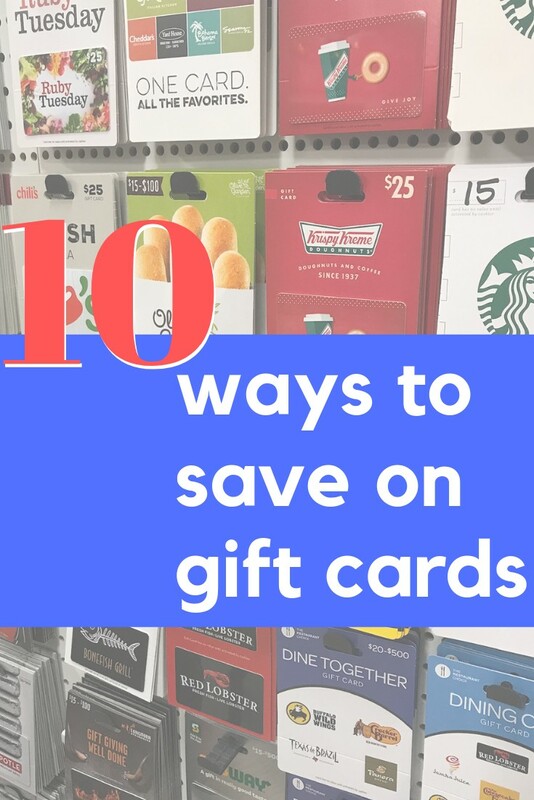 Check out 10 great ways to save money on Gift Cards and build a gift card wallet. Many major grocery stores offer gas station discounts/rewards when you buy gift cards in their store. While this doesn’t feel like an immediate discount, the gas savings can really add up. Depending on promotions they are running a $50 gift card can mean up to 20¢ off a gallon of gas. Multiply that by 35 gallons (at Kroger) and you’ve saved $7 or 14% off the gift card! Kroger’s FuelPoints program allows you to earn 2x the FuelPoints on gift cards. This equals 10¢ off for every $50. They regularly run offers for 4X FuelPoints though! Harris Teeter Fuel Points – earn 2X FuelPoints on gift card purchases. This is a newer program but they are ramping up other offers. Food City ValuPoints – earn 2X ValuePoints on giftcards, so a $50 gift card equals 100 points. 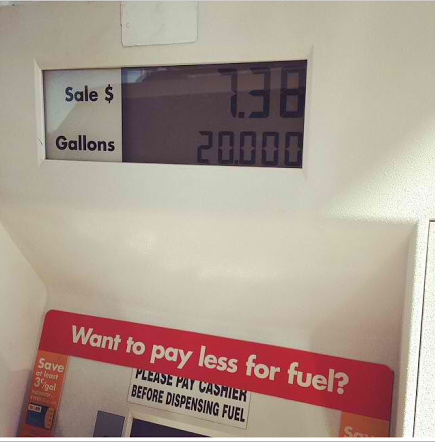 Redeem 150 points for 15¢ off a gallon of gas. While Publix doesn’t offer a reward program, never forget to use their in-ad coupon for $10 off a $50 gas station gift card! This is a good 20% savings and is good on any gas station brand you want. There are a number of sites that sell discounted gift cards. While I wouldn’t jump on every site you find, there are some that very trust worthy and offer guarantees that you will get the correct gift card value. Sites like Gift Card Granny, and Raise are my main favorites (Raise offers regular coupon codes that make the deals even better). We also see regular discounts on major retailer sites like Staples, eBay, Paypal and others. Tip: You can also earn money back by selling gift cards you no longer need! Check out our post on selling gift cards for cash back. We regularly see gift cards used as part of promotions and sale at major drugstores and grocery stores. 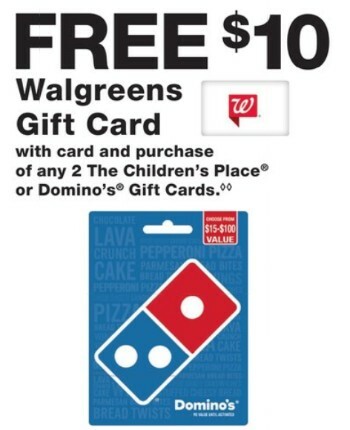 For example, head to Walgreens this week and get a free $10 Walgreens gift card when you buy $30 in Dominos gift cards, or earn Rite Aid BonusCash or CVS ExtraCare Bucks on participating cards each week. (We see these offers really ramp up around the holidays.) Even Dollar General gets in on the deals with regular sales up to 15% off select gift cards. If you have a credit card that offers rewards points based on your spending, you may be able to redeem those points for gift cards to places that you frequent. Check and see what your credit card company offers! Make sure that you are getting the best value for your points over other redemption offers though. Note: Many stores will not let you buy gift cards with a credit card however, if your store does then you could double dip and earn credit card rewards points on top of your discount or gas rewards! If you sign up for Swagbucks, you can take surveys and search the web to earn Swagbucks. Redeem your rewards for gift cards to places like Amazon, Walmart, eBay, or iTunes. Using this site for most of your web browsing can add up! Many years we get at least $50 in Amazon gift cards with our swagbucks. Both Costco and Sam’s Club are good places to get gift cards for eating out and movies. You do have to be a member, but often you can get gift cards for up to 25% off. An example of one deal we love to buy is gift cards to Atom Tickets regularly 25% off at Costco. You can use them on the Atom website or app to buy movie tickets and concessions. Plus you can then stack coupon codes and save a ton of money on going to the movies! Tip: Get a Sam’s Club membership for free right now. If you have a Samsung phone, you really need to check out the Samsung Pay App. While you may think it just helps you pay for things around town, they offer a lot of deals on gift cards all the time! Right now you can get 20% off Regal Cinemas, Applebees, BJ’s, plus many other discounts. We’ve seen Lowe’s Home Improvement, Old Navy, restaurants and more! Most discounts are 5-20% off. Once you get the gift card it is loaded straight into your Samsung pay account to use in-store. Save money on groceries and earn gift cards with a number of free mobile apps. My favorites are Ibotta, Checkout51 and SavingStar. 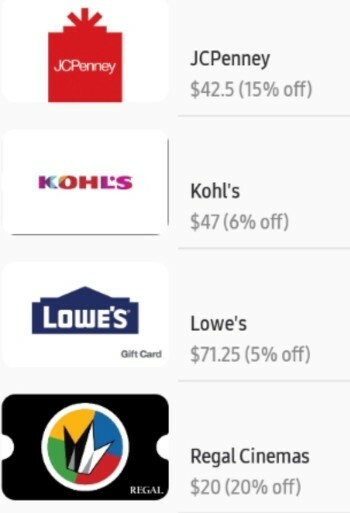 When you have $20 saved up (it will only take a few trips) you can “cashout” for gift cards to tons of favorite stores. If you don’t want to focus on buying specific items to earn gift cards, try out Fetch Rewards where you earn just by uploading pictures of your receipts. It’s super easy and you can start off with $2 worth of points when you use code N0REC at sign up. Another favorite is Shopkick that lets you earn rewards by checking into stores, scanning barcodes and other tasks. Many folks end up earning quite a lot of gift cards too! Clean out the closets and trade in used items to Amazon. They’ll pay you in Amazon gift cards for things that are just collecting dust right now. Some items won’t ring up for more than a couple of dollars, but the money can add up! Here are more details on how to trade in used items like electronics and video games for Amazon gift cards. Groupon frequently has gift card deals. Many of them are for select users only, so watch your email for offers! For example, about once a week I will get an offer for a $10 gift card for $5 to a place like Kohl’s or Starbucks. What are your favorite ways to save money on gift cards?